This little hoglet fellow was brought into the Ellerslie Vet Clinic last week – only a few days old, he was found crawling along the road! After nursing him for the day we luckily found a foster mom through the Hedgehog Rescue. Hoglets usually leave their nests between about 3 and 5 weeks old to go on foraging trips with their mum, and they soon have to learn to fend for themselves; after around ten days of foraging with their mother the hoglets will wander off on their own destination. 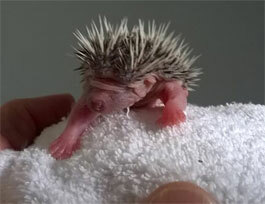 Did you know that Hedgehogs have four toes on the rear feet and five toes on the front feet in the Atelerix species. The nails on the front feet may need trimmed more frequently than the rear feet to prevent them from curling into the foot and damaging the footpad. Good luck in your new home, little Hoglet!